Have you been to Wildwood Coven? 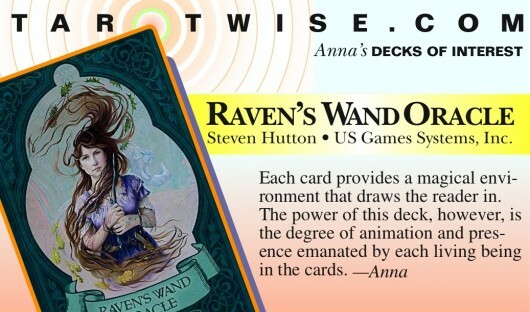 With this amazing new oracle deck, Steven Hutton not only gives us a personal tour of the vibrant world of witchcraft he created for his Dark Raven Chronicles trilogy, but the 44 dynamic card illustrations he created have raised the bar for oracle fantasy art. Each card provides a magical environment that draws the reader in. The power of this deck, however, is the degree of animation and presence emanated by each living being in the cards. And living beings abound. In addition to human and animal protagonists, the scenes are also filled with flying fish, mythical critters, fireflies, birds, ducklings, mini-dragons, raccoons, hogs, snakes, bunnies, wolves, and cats—-lots and lots of cats. Each of the beings seem to be inhabited by a strong, emotive personality that helps to convey the message of the protagonist.